You’ve heard the saying that a dog is man’s best friend, right? It’s true, but even the very best of friends can cause accidents that need solutions. Whether you’re potty training your puppy or your dog was alone too long because of the traffic jam you got stuck in, at some point in your dog-owning years, you’ve most likely experienced a dog pee accident. Now, if a friend of yours makes a mistake, you don’t get rid of him or her, right? It might be tempting to find Fido a new home if your carpet smells like urine and has a bunch of unsightly spots that you can’t make disappear. But don’t get rid of the dog; we promise it’ll get better. If you caught your dog in the act of peeing, congratulations. Cleaning up pee is best done when the pee is fresh. So, grab a paper towel and your dish soap, and act fast. Just squeeze a few drops of soap and water onto the pee spot and blot the spot. Don’t rub back and forth, as it forces the dog urine further into the carpet fibers. Blotting is the best thing you can do. If you don’t want to use your hands, a great way to clean it is to place the paper towel on the area and step on it again and again until you believe the dog urine is gone. Pour baking soda on the spot, and allow it to stay there overnight. In the morning, put some white vinegar over the soda (best science experiment, right? ), and let it sit for five to ten more minutes. Then, dab it out with a cloth. If you have a young dog that often leaves its urine on the carpet, a practical way of cleaning is to mix up a nifty concoction in a spray bottle. Mix 1 cup water, 1 cup vinegar, and two big tablespoons of baking soda in the spray bottle and shake well. You can spray this directly on the spot, allow it to rest for five to six minutes, then blot. Now you have this mixture on hand for all those dog pee moments. Another excellent pet urine remover comes from that well-known, ugly brown bottle. Hydrogen peroxide does a great job at removing dog pee. Just put some peroxide into a spray bottle, soak the stain in a few sprays, and let it sit for about 10 or 15 minutes. To finish the job, clean it up with a rag. Remember, don’t rub: dab or blot. If you’d rather use a product that is not homemade, try a store bought spray. There are fantastic odor and urine removers on the market today that use enzymes to clean. Some options include: “Nature’s Miracle”, which can be purchased at pet stores, and “Vet’s Trust”, a product that we sell here at our cleaning plant. It’s science in action: the enzymes in the pet spray products are proteins that connect to the urine molecules and bacteria within it. After joining with them, the enzymes cause the urine to break down and dissolve. What’s incredible about these sprays is that you don’t have to do any mixing or dabbing. Simply spray it on the spot, and let it do its magic. Depending on the product, it could take 24 hours up to a few weeks to get rid of the stain. Just make sure that you read the label before purchasing, especially if you want the spot removed immediately. Now, we’ve discussed how to get dog urine out of carpet. But perhaps you’ve blotted those spots just like we said, and you still have the dog urine smell in your living room. Never fear; we have more help below. One method is to give your carpet or rug a well deserved deep clean. You can purchase a carpet cleaner for around $175. If you don’t want to invest in an expensive product, you can rent a cleaner as well. Either of these options will help with getting rid of the urine odor in your carpet. Cleaning the carpet on your own is tricky. Sometimes you can’t see the spots where the odor is coming from, and occasionally, the scent is embedded so deep within the carpet fibers that you can’t eradicate it your own. Even if you were to rent or buy a carpet cleaner, there are some tough stains even high powered gadgets can’t erase. If you have stains or urine smells that won’t budge, hiring a cleaning company like Brothers Cleaning is a smart way to go. At Brothers Cleaning, we offer reliable, professional carpet cleaning at competitive prices. If you’d like to discover a little more about how we remove those pesky stains and smells, click here. 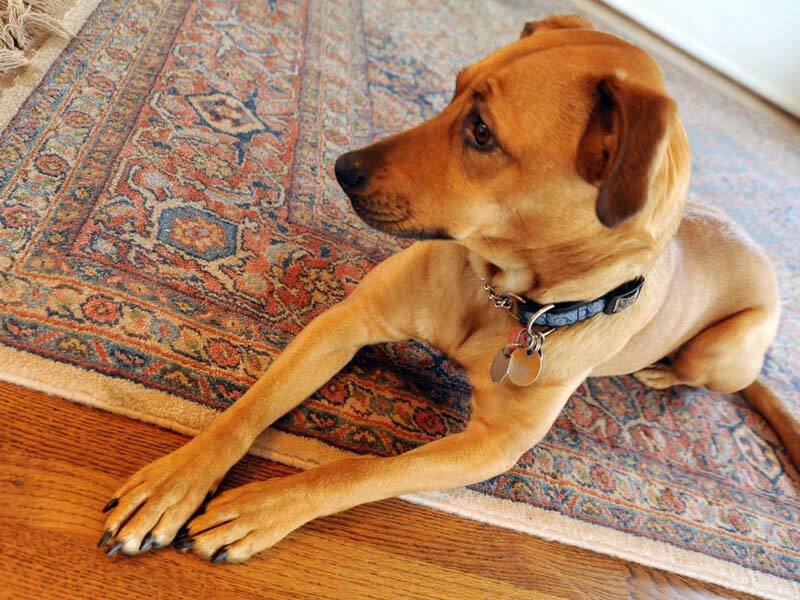 We hope that you read these helpful carpet cleaning tips before the notion crossed your mind to get rid of your dog. You really don’t have to do that. Keep your dog. Dogs make life so enjoyable. What you should do is get out that vinegar and water, baking soda, and some hydrogen peroxide, and put in a little elbow grease. It doesn’t take rocket science; just a bit of time, mixing, and blotting. If you don’t have the time to do it yourself, and you want to be sure that your carpets are deeply and thoroughly cleaned, call us today. We’d love to share our passion for cleaning with you. Your happiness is our goal.